Wow you guys, this episode 14. It’s another level, really. If you’re going to watch any lakorns this year – heck – if you’re going to watch any lakorns ever, do watch this. Just trust us crazy, bug bitten, fever ridden, fans of Buppae Sanniwas! I mean, have you guys seen me this hyped up about a lakorn before? Ok don’t answer that, I know I get pretty excited over some lakorns in the past. But I don’t believe I have loved, crushed, or obsessed this badly about both the hero and heroine. This is one of those shows where it keeps you wanting more, craving more, and falling in love with every cast of characters. They’re all really well written and it’s hard to hate them, even Constantine has several moments of pity, and he’s supposed to be the big bad. And that’s just the thing, no one character is truly bad, they just make bad choices. At the end of the day, it’s the choices that define them, choices that get written into history. We are at the final crux of the show, just one more episode to tie up historical loose ends, because if the show ends now – we have been given such a sweeping love story between our duo – Phor Daed and Kadesurang – across different lifetimes and karma, that I could be at peace with the story right now. I could imagine what their life would be like as time passes by, because you bet your bottom dollar that I’ll be thinking about this show for a long, long time. Heck, I don’t even know how I am going to move on. 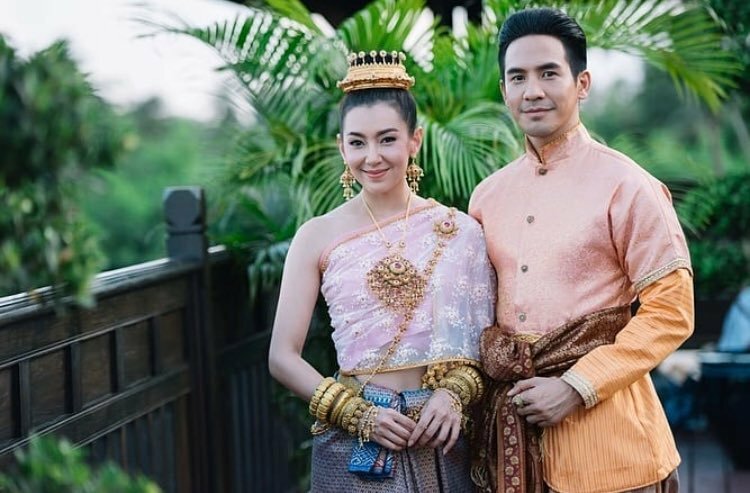 Truly, it will ruin other lakorns for me because I will be measuring it against this lakorn. The recurring theme of soul mate and reincarnation/karma is a bit of a doozy, it is not as simple as it sounds. If you’re not familiar with this, you will have to watch the whole story in its entirety to see the overarching argument. It’s hard to glean what it all means until the story plays out. I for one, am familiar with the notion of reincarnating and soul mates – but not to the extent of this story – so I do appreciate where the writer is taking us. This story has different levels of karma, how people’s fates are intertwined based on their actions and the debt they have to repay in their future lifetime. And just because you die or cease to exist, you still have to pay the price. Sometimes it’s very steep. Take for example, Karakade and Kadesurang. It turns out that they are twin sisters. However due to some bad karma, they are again sisters in every lifetime, however one of them always ends up dying first. They never truly get to live out their life together. Due to Karakade’s wish to redeem herself, the Kadesurang in the future (who got in a car accident and died) goes back in time to reborn as the older Karakade. By doing good deeds in this new lifetime for Karakade, she gets to pay her debt in hell at a shorter span of time and perhaps be reborn as Kadesurang’s sister in another lifetime, and maybe they can actually grow up together. Another karma example is Phor Daed and Reungrit, who is Phor Daed’s future reincarnation. That twist is still blowing my mind, but I understand now after the seeds that the writer has planted from the beginning and throughout the show. I just can’t see it because I was convinced of something else. What do they say about being convinced about something? Oh, don’t be too convinced because then you can’t see the truth. At any rate, Phor Daed promises to ordain forever if he doesn’t get to be with his one true pairing, Kadesurang. That might have sealed his fate with Kadesurang. Since she died in the present, Reungrit must ordain in order to send her back to the past to be with Phor Daed, his past self. At least one of them had a happy ending? Despite the bittersweet karma, the message here is one of hope. That you never truly cease to exist, that you take on some form of body and person in the next lifetime. Whatever or whoever you are in this lifetime is due to your actions in the past lifetime – so if you do good and create good karma – then you’re only doing yourself a favor for the next life. It’s a Buddhist teaching that not only promotes people to be hopeful and do good deeds, but it also teaches one of coping mechanisms. Because if a loved one dies too early, we know that we didn’t do enough good karma together but that maybe we can see each other in the next lifetime. And if you’re true soul mates, at least you know that no matter what happens, you’ll end up together, even if it takes 2 lifetimes, and one of you have to travel to the past and be reborn. The Show does a good job in making this point. At the end of the day, it’s an uplifting, positive story that we need right now. And it’s a huge success in Thailand for many reasons, it shows the history, the culture and the characterizations in such a positive, nonjudgmental manner. And the romance? Forget about it, you’re just going to be swept up in their love story and won’t even know what’s up or down. The way their love story is written, where they start at the bottom (so low that you wonder how they’ll ever go up) but believably, and one beat at a time, we get to indulge in how they slowly come to fall in love. It’s the daily rituals that get me swept up, the way they come to learn about one another, the longing gazes and close proximities, not to mention their oh so romantic (and often times funny) dialogues and encounter by the moon and the Chao Praya river. Phor Daed has to be one of the most dashing and romantic man (Ayutthaya notwithstanding) out there, truly one of my favorite Pope characters and pr’eks to date. In the beginning, he’s often stoic and doesn’t want Kadesurang to know what he’s thinking or feeling for her, but he doesn’t waste a beat to warm her up with his words and making her (and us) swoon in the process. However when he’s fully in love, Kadesurang does not stand a chance. He will move heaven and earth to be with her. While Kadesurang on the other hand, she wears her heart on her sleeve. She’s kind and beautiful on the inside, and that’s truly what matters. The beautiful Karakade couldn’t measure against her big sis and she learns the hard way. But I’ve fallen in love with Kadesurang too, from her funny demeanor (she doesn’t take herself too seriously), from the way she seemingly takes care of others without even a thought to herself. It’s no wonder people gravitate towards her. It’s no wonder, we love her so. Their sweeping romance is one that elevates the story. Their chemistry is one that sold the romance, but at the end of the day, it’s the story as a whole that keeps me coming back for more. I care about these characters and I want to see them make it out there in the “real” world, and after this pre-finale episode, I know they’re going to be just fine. 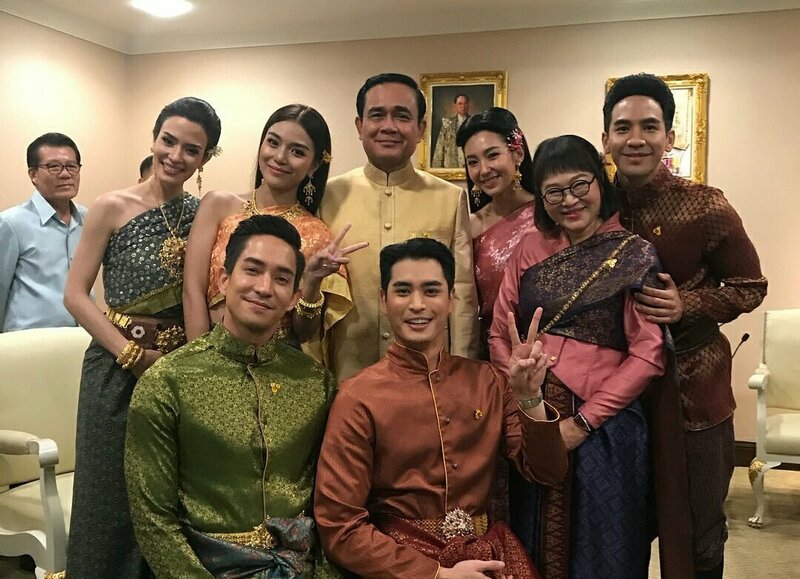 Come what may, this lakorn is one for the books. So, or jao, come and join this madness we call Buppae Sanniwas. Because today is a good day to watch a good lakorn. Head on over to Twitter (@lovefia1210) to read my recaps for episode 14. I will also tweet during the final episode as well, since I might have fangirled as much as a fangirl can spazz on this article. Ah, but there’s really no limit to a fangirl’s heart though, is there? I think this is the best drama to date for both Pope and Bella. I love both characters. and we actually got the kisses which normally Channel 3 avoids… I understand why the drama is so popular now. Lol Fia did you know this lakorn solved Bangkok’s traffic problems during its airing times? Because people would stay at home to watch it live. Hihi Fia! Greetings from Singapore! I got to know about Buppae Sanniwas from the internet, now watching the drama (only started watching last week, at ep 6!) with chinese subtitles (chinese subtitles provide detailed explanation of the history/temple/characters etc). Chance upon your blog cos was searching the internet for synopsis/recap ^^ Thank you so much for doing the recap! All I can say is, I’m addicted to this lakorn! It is even better than some of the Korean Dramas that I’d watched! Read the news from the net that they are planning for season 2, hope it will be as good as the current one! Hi Tuyah! It’s my pleasure, and I remember all of your comments, glad to draw you in again:) I will write another final post on BS, just need to find the time. Soon I hope! You’ll have to send me the link, curious which tweet they posted, I might have written like a 100x about this lakorn. This show has made us all a little crazy to say the least. Good to hear from you! https://www.youtube.com/watch?v=Q4LiLeSMzfo Here it is around 4:23 you twittered about Sri Phat.